4 February Register of Electors - The registration system changed last year. Everyone is now responsible for registering themselves. Anyone who has not registered and wishes to vote in the elections on 7 May must do so by 5pm on 20 April. 14 February An amount of bottles and cans were collected by the Noah's Ark bus stop and recycled. The Council have been asked to place a litter bin there in the hope of discouraging people from leaving their rubbish in the gap between the wall and the hedge as they do now. As they have none in stock currently it was suggested that they transfer one from the opposite side of Hartshill Road where there are three within a short distance. 18 February The Newsletter will be collected from the printer on Friday 27 February and delivered to the distributors over the weekend of 28 February/1 March. 20 February The Minutes of the Committee Meeting held on 10 February have been uploaded to the website. 20 February The planning application to create a private gym/treatment centre in the former St Dominic's Sports Hall has been approved. The Residents' Association commented on the fact that there is no proper footpath on the road, which would need addressing should the rest of the site be developed with housing. 20 February The Friends of Hartshill Park are holding a litter pick tomorrow morning. Meet at Vicarage Road car park at 10am. 21 February The Litter bin mentioned above is now in place by the Noah's Ark bus stop, having been moved from its previous position by the seat opposite. 21 February The Friends of Hartshill Park collected enough litter today to fill the truck twice over, requiring it to make two trips to Cromer Road. Most of litter, bottles and cans came from the slope below the path leading from Tesco to the steps into the Park by the Laundry Pool. There was also some flytipping removed from St Dominic's Car Park. 19 March The Minutes of the Committee Meeting on 10 March have been published to the website, as has a Report of the Public Meeting on 16 March. 19 March The Friends of Hartshill Park hold their monthly meeting this evening at the Jolly Potters beginning at 7pm. The next work party is on Saturday and will meet at St Dominic's Car Park at 10am to work on upgrading the steps by the Boardwalk Pool and the path leading from the Safe Route to School towards the Boardwalk Pool. 28 March Details of Easter Church Services for Holy Trinity, St Thomas' (Penkhull), St John's (Trent Vale) and Our Lady of the Angels and St Peter in Chains have been placed on the Noticeboard and published on the website as a Newsletter Extra. 28 March Attached are two photographs (before and after) of the rear yard of a house in Albany Road which was cleared of rubbish constituting a health hazard by the Council under the Prevention of Damage by Pests Act 1949 after representations from the Residents' Association and Councillor. The Council will now recharge the owner for the cost of the work. 14 April Concrete Utilities Cover by Rosemary Ednam Close smashed probably by lorry driving over by the tyre marks on pavement. It has been barriered off awaiting replacement. 27 April The Sentinel reports that Harplands Hospital is to install Automatic Number Plate Recognition cameras to those parking there and neither staff, patients or visitors. The car parking being free is being filled by persons either working or attending the Royal Stoke University Hospital to the detriment of authorised users. 5 May The Sentinel reports that the application to extend the life of the temporary COPD car park for a further 2 years until 20 June 2017 has been granted. 8 May The Sentinel website reports that Randy Conteh has been re-elected to serve as Councillor for Penkhull and Stoke and Shaun Pender re-elected as Councillor for Hartshill and Basford. 11 May The X28 bus service operated by Wardles from Keele to Hanley along Hartshill Road has been discontinued. Together with the loss some time ago of Scraggs 31 service from Newcastle to Hanley meets that there is no longer a direct service to Stoke Station and Hanley from the stop by Nirvana and from the stop by Grice Road. 11 May Cafe Divine closed sometime ago and all the tables and chairs removed. 26 May Summer Newsletter published to the website - delivery will be made week commencing 1 June in preparation for the Public Meeting on Monday 15 June. 27 May The Hartshill and Harpfields Handbook published in 2013 has been updated and is now available on the website - see the Hartshill and Harpfields Handbook page under the Newsletter heading. 27 May A list of voluntary and social organisations based in Hartshill is now listed on the website under the heading More. 29 May The mattress which became a health hazard was removed today from the alleyway at the rear of Hartshill Road. 2 June A Community Clean Up Day concentrating on the alleyways in Hartshill will take place on Thursday 4 June at 10am. Meet at the corner of Hartshill Road and Coronation Road. 5 June The Clean Up of the alleyways between The Avenue and Coronation Road and between Coronation Road and Albany Road produced an enormous amount of rubbish which removed by a Council truck just after 1 pm. Some of the overgrowth in the latter alleyway was also cut down and removed. Some rubbish from alleyways on the opposite side of Hartshill Road was also taken away including that from two brown bins which were filled with non-garden or household waste. Please take your bins back to your premises after they have been emptied, leaving them out allows people to put all sorts of unacceptable rubbish in them which may mean collectors will not empty them. Rubbish from the alleyway by 311 Hartshill Road (the former Mac Aquatics premises) were also taken away. 10 June The alleyway between Egerton Road and Linley Road cleared of much of the overgrowing weeds and rubbish and eventually removed by Council. 17 June Motor Scooter stolen from Riseley Road, probably the one later found burnt out on Hartshill Park. 20 June Midsummer Fair - We sold 13 HHRA mugs and received 12 completed Railings questionnaires. 23 June Sentinel article and editorial on parking at the Hospital which suggested that the only real solution was better use of public transport. 11 August The August Committee Meeting recorded the following Planning and Licensing Applications - Planning Application 58594/FUL Former Cafe Divine change of use to a drinking establishment. Any comments to be made before 25 August. Licensing Application Quality Superstore 328-330 Hartshill Road Premises Licence to serve alcohol from 9am to 8pm everyday. Comments by 22 August. 7 September A lively PACT Meeting was addressed by Mark Hackett Chief Executive and Mike Brown Head of Facilities Management University Hospitals of North Midlands on the mainly on the subject of the recommendations of the Arup Traffic Management Strategy which sought to identify future needs relating to the provision of car parking and access by public transport. It was agreed that some form of multi-storey car parking was required, but the siting of such was open to question. The two likely sites would be the temporary COPD car park or somewhere on the Royal Stoke site. There was little possibility that one might be constructed on land not presently owned by the Trust. Such a car park would help reduce the need for a shuttle bus service substantially, since the amount of parking required on the NSRI site would be substantially reduced as part of that, excluding the parking area closest to Queen's Road, would now be available for marketing. Some money is available to construct a multi-storey or decked car park. 16 September News item and photograph in Sentinel with headline Hospital pledges 700 extra parking spaces. The photograph is of residents of Ashlands Road with Councillor Shaun Pender who are worried that any development on the former COPD site's car park with bring even more traffic along the road which already suffers extraordinary congestion at peak times morning and afternoon. Residents prefer to see the required spaces being provided for on the Hospital site itself and the COPD site sold for housing development has originally proposed when outline planning permission was granted. 21 September The Association celebration of its 20th Anniversary attended by the Lord and Lady Mayoress and funded by a Grant from the Big Lottery Fund is recorded on the History of the Association page with photographs of the Event. The Report of the Public Meeting has been uploaded to the website and can be found on the Reports page. 28 September As agreed by the Public Meeting a letter is delivered to Mark Hackett the Chief Executive of the University Hospitals of North Midlands containing the resolution agreed at the Meeting with regard to the future of the COPD car park. This is appended here. 29 September Another news item in the Sentinel stemming from comments at the Public Meeting and concerned with the perennial problem of the number of journeys along Ashlands Road by the Hospital shuttle buses. These operate from early morning until late at night and are most frequent at peak times. What is most galling is to see, for most of the day, so few people using them, many preferring to walk. An attempt a few months ago to vary the route so that buses returning empty from the Hospital to the NSRI car parks was met with objections and was never implemented. One can see that the claimed security reasons may be valid during the very early morning and late at night, but not for most of the day. 29 September Hartshill Cemetery The removal of dog bins near the bottom entrance gate has not stopped people thinking that the site is still the place to leave their doggy does as the photograph shows. It has been suggested to Bereavement Care that they might consider a suitable container (one of the Euro Bins) since it is likely that some people seeing the pile will think it right to continue to deposit their bags there rather than take them home or find a Euro Bin elsewhere in the Cemetery, which they are unlikely to do so. 1 October A presentation to show plans for the redevelopment of the St Peter's Academy site will be held at Penkhull Village Hall on Tuesday 13 October from 4pm to 8pm. ​1 October Sentinel news item reporting that City Council is to spend money on clearing flytipping from non-public land which includes unadopted alleyways. There is also a mention of the money that Maria and Andy from Bits' n' Bobs have spent on equipment to clean up unadopted back alleyways in Hartshill. There is also money to spend on works in default on privately owned heritage assets which have been neglected by their owners - this might include the Rosemary Ednam Memorial Railings. We are told by the City Conservation Officer that the money mentioned for privately owned assets will be to take court action against owners - this is unlikely to happen in the above mentioned case because of the multiplicity of ownership of the Railings. 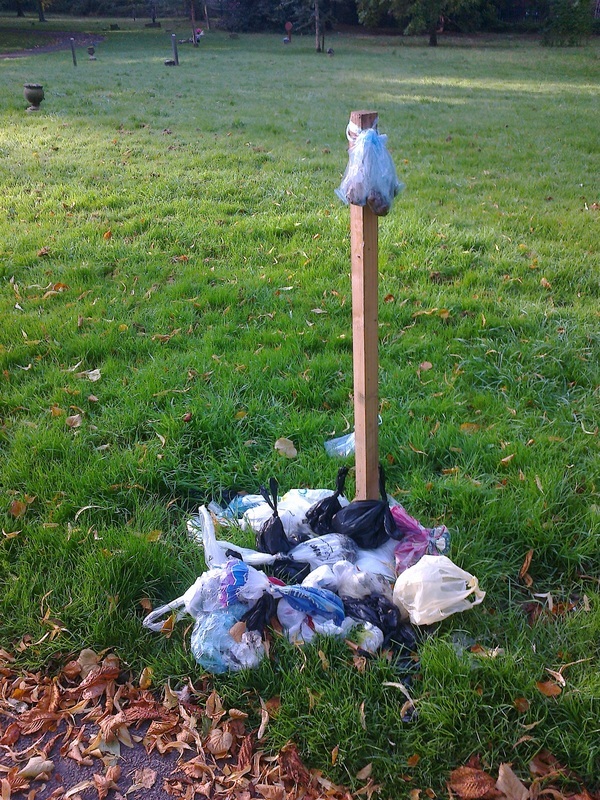 ​5 October Further to the item on 29 September regarding the depositing on dog waste in Hartshill Cemetery. There is now a wheelie bin in place on the site of the photograph into which dog waste must be put. ​6 October The wheelie bin reported above was not put there by Cemetery staff, was removed outside the Cemetery by the gate and was not there this morning. There were no dog waste bags on the site of the former dog bins. 23 October There will be two more collections of Brown Bins this year - November 13 and November 27. 11 November At a meeting of the Hospital Liaison Committee we were informed that the Hospital are considering areas on the Hospital itself for decked car parks and also the possibility of acquiring the Ambulance Station site should that become available and prove suitable. There is unlikely to be anything further to report for the next few months. 16 November The Annual General Meeting approved the election of Gerald McHugh to the Committee. 21 November At the Christmas Fair the Residents' Association sold 10 HHRA mugs. ​26 November The Planning Application to build a new house in front of the Old Vicarage have been rejected has being not in keeping with the Conservation Area.